Developed by Atarisoft in 1983. Originally written by Brian Fitzgerald and released by H.A.L. Labs, but under the name of Taxman. Atari first threatened to sue Fitzgerald and H.A.L., but later bought the program, and re-released it as Pac-Man. 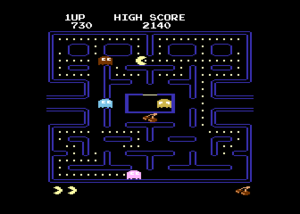 Developed by Atari in 1981, the official Atari 2600 version of Pac-Man is considered by many to be the worst Pac-Man conversion made. The only bonus prize is a brownish-yellow square (known as a "vitamin") that appears underneath the ghost regenerator periodically. 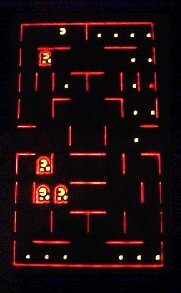 Rather than stretch the maze as in other versions, the Atari 2600 implementation turns the maze on its side, so the tunnels are at the top and the bottom, rather than the left and right. An extra life will be granted every time the maze is cleared, regardless of your current points. The cartridge features eight variations by presenting the player with four choices for the ghost speed, and two choices for the player's speed. The ghosts' behaviors are broken down as a permutation of smart/dumb, and slow/fast. Developed by Atari in 1982. Even though Atari dropped the ball when it came to the 2600 version, the Atari 8-bit line of computers was treated to one of the most accurate conversions available. The only thing glaringly different is that Inky is green instead of blue, the Galaxian flagship was changed to the Atari logo, and the maze is stretched out to fill up the television screen. Every other aspect of the game is faithfully reproduced, including the intermissions. The Atari 5200 version is identical, with the exception of the controllers being difficult to use. Developed by Atarisoft in 1983, but never released. The prototype ROM was discovered, and released to the public. The port is extremely accurate, possibly surpassing even Atari's own 8-bit conversion (which, it has been suggested, is the reason it was not released.) See below for information about Opcodegames' homebrew cartridge, entitled Pac-Man Collection. Developed by Atarisoft in 1983. This version is nearly identical to the Atari 8-bit conversion, but for the fact that the Galaxian was unchanged. It was later re-released by Thunder Mountain. Developed by Atarisoft in 1983. Claiming limitations of the resolution of the VIC-20, this version features a simplified maze, However, H.A.L. released a version that had no problem displaying the maze (or all 4 ghosts). Three of the ghosts have also been colored different - Pinky is white instead of pink, Inky is green instead of blue, and Clyde is yellow instead of orange. Commodore and HAL Laboratory released a game for the VIC-20 called Jelly Monsters which was a more faithful conversion of Pac-Man - however, Commodore was forced to halt game sales due to copyright violations. This Japan-only conversion of the game for the Fujitsu FM-7 home computer was released in 1984. To account for the difference in screen size, the maze was rotated 90 degrees counter-clockwise. The speed is considered somewhat slow. Developed by Namco in 1991. You can choose between two views when you play, a full sized view that scrolls, and a half sized view that fits the whole screen. All of the ghosts are the same color, and therefore indistinguishable by sight alone. Developed by Namco in 1999. This is a color-corrected version of the original Game Boy conversion. Other than the addition of color, the gameplay is identical to the regular Game Boy's. It does, however, come included with a GBC conversion of Pac-Attack, a Tetris-style puzzle game. Pac-Man was included by Nintendo as part of its Famicom Mini/Classic NES series and released in 2004. This game plays nearly identically to the NES conversion, with the exception that the sprites look larger than the maze, but in reality it is the maze that has been shrunk to fit the screen. However, prior to this release, Namco had published the Pac-Man Collection, first in the U.S. in 2001, and later in Japan in 2002. This version contains a far more arcade-accurate version of Pac-Man along with three other Pac-Man games. The only reason to buy the Classic NES version would be if you were a die-hard fan of the NES version over the arcade version, or if you wanted to complete your Classic NES collection. Developed by Atarisoft in 1983. The maze is not quite perfect and the gameplay is a little slow. Despite this fact, Atarisoft developed a rather accurate port for the Intellivision. The ghosts' behavior is similar to the arcade version despite the simplified maze, and the controllers are responsive. The sound is almost identical to the Atari 8-bit computer ports, and even the intermissions are included. Developed by Namco in 1984. This is the first home conversion directly developed by Namco for another system. It pioneered the use of a reduced maze with the correct aspect ratio and a score display on the right, that is still in use today by Namco's classic Namco Museum compilation discs and the TV Plug N' Play games. Developed by Namco in 1999. You can choose between two views when you play, a full sized view that scrolls, and a half sized view that fits the whole screen. All aspects of gameplay are faithfully reproduced. This version is so accurate in fact, that many of the arcade patterns will actually work in this conversion. The only drawback is the controller's tendency to hit diagonals; to offset that the cartridge was shipped with rubber rings that restrict the movement of the joystick to 4 directions. Developed by Namco in 1984. This version takes the formula established by MSX version and corrects many of the color issues that were due to graphical limitations of the MSX. 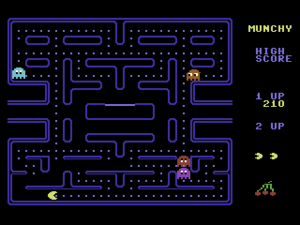 Due to the reduced size of the maze, there are fewer pellets to be eaten to clear it, but the rest of the gameplay mechanics are faithful to the arcade version. In the United States, Namco's port was licensed to Tengen and released in 1987. After Tengen was sued by Nintendo for patent infringement, Namco re-released the title, side by side with a Ms. Pac-Man release, in 1993. The NES version fixes some issues from the arcade version, but introduces new ones. Notably, in the arcade ghosts switch directions whenever they switch between "Scatter" or "Chase" modes, but in NES Pac-Man they only reverse when going from Scatter" to Chase," making it harder to deduce ghost behavior. The collision detection of the ghosts also seems to extend out further, making it harder to evade them. There is no kill-screen or known split-screen, the keys just continue. The score has a millions digit, so it could go up to 9 million plus. The final repeating maze is actually the 10th key, not the 9th key, and there are no screens where the ghosts don't blink. In the arcade, the 9th key level slows Pac-Man down, but that does not ever happen here. There is a bug starting with the 10th key level that makes the initial Scatter period the ghosts start the board in very long. Developed by Atarisoft in 1983. As with the Atari 5200 conversion, the bonus prize of the Galaxian flagship was changed to the Atari logo. It was later re-released by Thunder Mountain. Developed by Namco in 1990. You can choose between two views when you play, a full sized view that scrolls, and a half sized view that fits the whole screen. All aspects of gameplay are faithfully reproduced, including the three intermissions. Developed by Atarisoft in 1983. As with their unreleased Colecovision version, Pinky is colored purple instead of pink. Developed by Microsoft as part of Microsoft Return of Arcade (1996) and Microsoft Return of Arcade Anniversary Edition (2000). Unlike many of the other versions, this version was entirely reprogrammed to simulate the original, rather than being based on the arcade version's code. The menus contained the original's dip switch settings, but did not feature "Coin A" or "B". Microsoft made Pac-Man available for download on the Xbox Live Arcade for 400 points. It is very accurate to the original arcade version, and contains a total of twelve achievement points that can be earned for completing certain tasks or stages. This version does have some major changes from the arcade version. There are 256 levels which you can select from once you complete them, and no split-screen. The levels just keep repeating, and start at cherry, and go back through the keys (along with the intermissions). The difference is that the energizers do not make them turn blue, so it's no blink boards. Basically you keep using your 9th key pattern until you quit, or lose all your lives. In 2007, Microsoft conducted a worldwide Pac-Man World Championship contest, which was sponsored in part by Quiznos. Nelsonic created a line of digital watches that were capable of playing video games, including Frogger and Q*Bert. 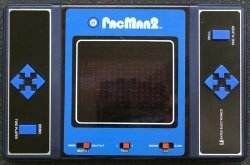 Due to Pac-Man's popularity, Nelsonic distributed two versions of Pac-Man, at two different price points. The lower priced watch, which is more common (shown left) featured a set of four direction buttons to direct Pac-Man with. The gameplay is based directly off of the Tomy handheld game featured below, and features a shortened version of the handheld's maze. 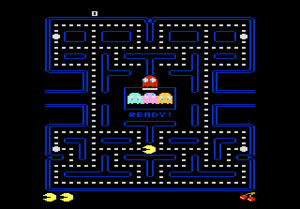 As a result, Pac-Man can only eat the pellets when moving to the left, and never to the right, a common criticism of this version. It features sound, high score saving, and an alarm feature that plays Dixie. The more expensive version (shown right) features not just one, but two LCD layers, one for the watch, and one for the game. It also features a tiny joystick for the controller. Like the other watch, it is based off of a Tomy product known as Watchman Monsterhero. 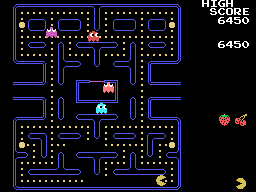 The gameplay is fairly faithful, however Pac-Man must eat a maze full of strawberries with two bananas which serve as power pellets, and a star as the bonus. There are two sets of tunnels positioned in each corner that wrap to the opposite corner. There are two games variations, one where the maze is static, and one where the maze changes slightly throughout gameplay. The second watch went through a few design changes, most notably a change from a knob type joystick to a flatter joystick into which a stick could be inserted. Like the button version, it also features sound, high score saving, and an alarm feature. The joystick version also features on-screen date, day of the week, and seconds display. Both watches' scores max out at 1999, at which point the game immediately ends. Before Coleco launched the ColecoVision, it manufactured a series of table-top games, based on several popular arcade games. These table-tops were designed to look exactly like miniaturized arcade machines that you could take home and play. Naturally, the game play wasn't spot on, but it was rather close, given the limitations of the technology. 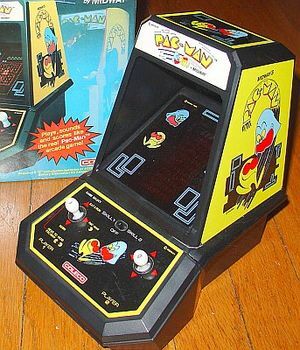 The Pac-Man table-top featured two joysticks that allowed for head-to-head play. The player would initiate play by pushing the joystick in one of four directions, with each direction dedicated to a different mode. There was a demo mode, a one-player mode, and a two-player head-to-head mode. There was also a fourth mode, known as "Eat and Run", that featured different rules. 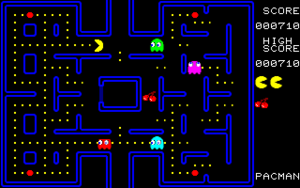 In this mode, Pac-Man started out in the ghost regenerator and had to eat as many power pellets as he could before returning to the regenerator, to collect a bonus. The other three modes were all faithful to the original gameplay. Like the other Coleco table-top games mentioned below, the game featured loud, harsh, almost squealing sound effects that could not be disabled, and were frequently cited as their worst feature. The other seven Coleco table-top games were Galaxian, Donkey Kong, Frogger, Ms. Pac-Man, Zaxxon, and Donkey Kong Jr. (which was directly licensed from and manufactured by Nintendo). 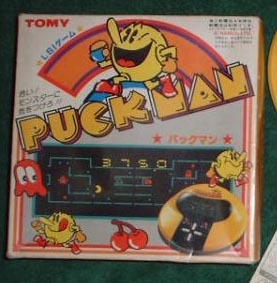 Tomy launched a handheld in Japan based on the arcade game's original name of Puck-Man. This handheld is flatter and wider than other table-tops that were available. In this version, Puck-Man is always animated as facing left. As a result, the rules of this handheld stipulate that Puck-Man can only eat dots as he proceeds to the left. Moving to the right, causes Puck-Man to merely pass through the dots. Two power pellets, and a pair of parallel escape tunnels complete the set of features. Cherries appear as bonuses and the left button must be pressed while Puck-Man is next to it to collect them. Only three ghosts will chase Puck-Man in this version. Although not as popular as the Coleco table-top version, presumably because of the Coleco version's aesthetics, the Entex handheld was slightly more faithful to the original arcade version. 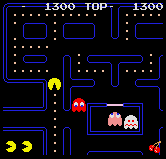 It also allowed for two players to play head-to-head against one another, with one player as Pac-Man, and another player as the single ghost, on the playfield. 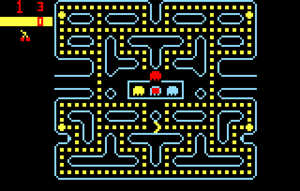 In the one-player mode, the player can select how many ghosts will chase after Pac-Man - either two, three or four. There are four power pellets, one in each corner, and single tunnel in the middle of the playfield. The game also features sound which can be switched off. Ultimately it was discontinued due to a licensing dispute with Coleco, makers of table-top. Because so many people were disappointed by the official Atari 2600 version (which was written in only 4KB of code), some hackers have tried to make up for the lack of a proper Pac-Man conversion. Many people have succeeded in bringing a more faithful version of the game to this system, mostly by hacking existing games. The following is a list of four interesting contributions, in order of least accurate to most accurate. 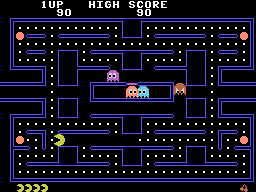 Hack of Pac-Man (8KB) This is a hack developed by Nukey Shay. 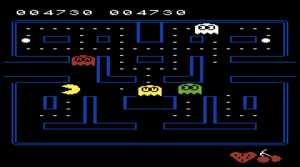 The goal of this hack is to double the size of the original Atari 2600 Pac-Man ROM size from 4KB to 8KB, and get as close to the arcade game without changing the maze. The colors have been fixed, animations have been improved, fruits and intermissions have been added, and points are adjusted. Since this hack is made possible by the increase in memory, it is named "Pacman8k". Hack of Ms. Pac-Man (8KB) This hack of Ms. Pac-Man was initially created by Rob Kudla, and improved upon by El Destructo and called Mr. Pac-Man. It uses the Ms. Pac-Man code as a basis to reproduce Pac-Man rather successfully. 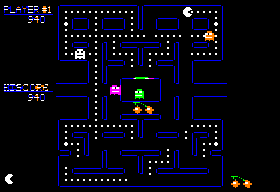 In 2011, hacker Nukey Shay further enhanced this hack by making the visuals more faithful to the original arcade game and entitled it "Pacman Arcade Enhanced". 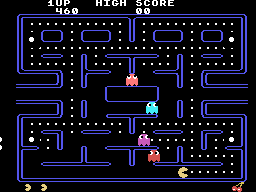 Original homebrew (4KB) This is the first version of Pac-Man that is not a hack of an existing game, but rather a completely original work built from the ground up. Programmer DEBRO wanted to see how close he could get to the original arcade version of Pac-Man using the same limitation in memory size (but not time) as Tod Frye had. The result is remarkable, and only missing a few of the more cosmetic aspects of the game. Since it maintains a limited amount of memory, it is called "Pacman4k". 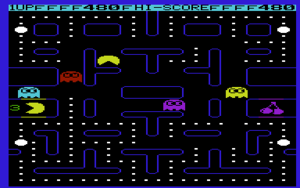 Original homebrew (4KB) Several years after Pacman4k was released, another homebrew version of Pac-Man that fit inside four kilobytes of memory was released. Like the previous homebrew, it does a remarkable job capturing a large number of features from the original arcade version with a very limited amount of code. It has no official name, but is simply referred to as "new Pacman". Hack of Pesco (16KB) "Hack'Em" is a hack of the Ebivision game called Pesco which was released in 1999. Pesco began life as a faithful conversion of Pac-Man, but was changed at the last minute to avoid a lawsuit. Since then, hacker Nukey Shay has been diligently converting the rom back to Pac-Man, and even improving on the original plan by adding Pac-Man Plus and Hangly Man derivations of the game to the rom. 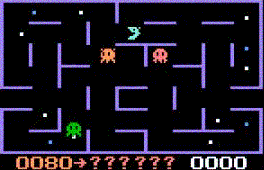 Although an 8KB version exists, the 16KB is considered by many to be the most accurate conversion of arcade Pac-Man available on the Atari 2600. 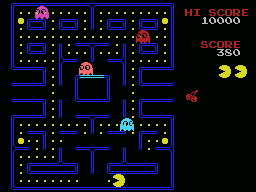 Note that many of the above screenshots have been doctored to display Pac-Man, all four ghosts and all four power pellets in a single frame, which does not occur during real play. 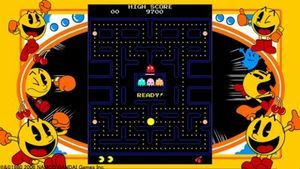 AtariAge.com forum member PacManPlus has hacked the original Ms. Pac-Man rom in to, not only Pac-Man, but a number of Pac-Man related projects like Pac-Man Plus, Hanglyman, Ms. Pac-Attack (a hack of the original Ms. Pac-Man arcade that altered the maze layouts), a multiple maze version called Ultra Pac-Man. He has collected all of these hacks into one cartridge entitled Pac-Man Collection. PacManPlus did more than just alter the maze and colors, he's updated the graphics and taken many beta tester's suggestions in to consideration to make the most accurate conversion possible. Bally released a conversion of Pac-Man for their Astrocade console. While they owned the arcade rights to Pac-Man, they did not own the home console rights, so they changed the name of the game to Muncher, and then ultimately did not release it for commercial sale. It is extremely accurate despite the poor resolution ability of the system, and features the maze in the correct aspect ratio. 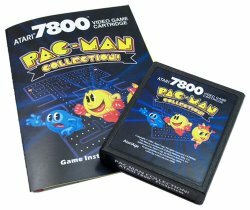 Opcode Games, developer of new titles for the Colecovision system, has developed a homebrew cartridge that includes versions of Pac-Man, Pac-Man Plus, and Ms. Pac-Man, with the aim of making them as faithful to the original arcade versions as they can possibly be. Despite limitation on the display resolution permitted by a television set, the conversions are considered to be quite accurate and well made. Munchy is a Pac-Man clone that contains a remarkably accurate maze arrangement and dimensions. The ghosts even possess properly animated eyes. The fruits differ, and the ghost behaviors aren't perfect, but it is a remarkably accurate conversion, possibly even surpassing the official Atarisoft version in appearance. Definitely a superior clone in an incredibly crowded field. While Atari had the rights to release Pac-Man for computers in the United States, HAL Laboratories had the rights in Japan. They created this version of the game which was clearly more accurate than the Atarisoft version. Commodore changed the name to Jelly Monster to avoid legal problems, but Atari still tried to pressure the game out of the market. Magnavox developed the famous "Pac-Man game that wasn't Pac-Man" called K.C. Munchkin. K.C. was blue and was chased by three ghosts. He had to gobble up 12 dots (4 of which were power pellets) that wandered endlessly throughout the maze. As K.C. ate each dot, the rest sped up. K.C. only had one life in the game, and he didn't have a long life on the shelf either after Atari sued Magnavox over K.C. 's similarity to Pac-Man and won. This page was last edited on 15 June 2017, at 17:37. This page has been accessed 53,196 times.